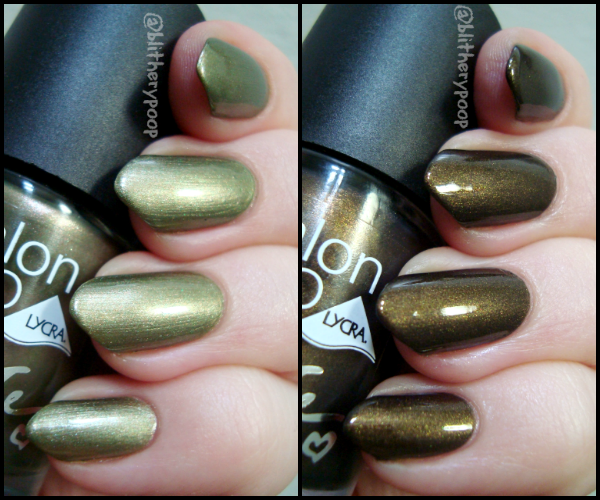 If you saw my Bronze Bird stamping yesterday, you've already gotten a bit of a look at these two polishes. They're new to the US, but they originally came out last fall in the UK. I'm a little surprised that they're just tucked into the side of the big display without much fanfare...and that the collection doesn't seem to have a name. British bloggers Polly Polish and Imagination In Color have swatches of the full collection, but I picked the two that drew my eye the most when I found them in CVS a little while back. Mercury is a light pea green metallic. I hesitated on this one. The bottle was hinting that it might be on that metallic/frost border. It is. Dunno exactly how I feel about that. Hanna of Polly Polish was 100% correct when she said it had a 90's feel. This could absolutely be a Street Wear from the olden days. The formula is as iffy for me as the frostiness. One coat was enough to cover, but I needed a second to even things out. This is a polish you have to coddle to keep from getting excessive brushstrokes. The brush itself makes that tricky, because it is MASSIVE. I had a little bit of my old nemesis, pinprick bubbling, on my middle nail. I think in this case it was caused by having to go a little thick to reduce the brushstrokes. Polishes like this cry out for sponging. I added a third coat that way and it really improved things. Saturn is deep brown with tons of greenish-gold shimmer. No doubt at all here. I really like this one! It's got that darker around the edges effect that always wins me over. The formula is a lot easier, though it is really thick. This is two coats. It's happened so many times before, but mattifying turned like to love yet again! Bottom line: The brush is very wide. Between that and the big, round cap, I found them somewhat difficult to apply. If you're a fan of wide brushes though, you should check out the Salon Pro line. Both are thick, so they stamp well. 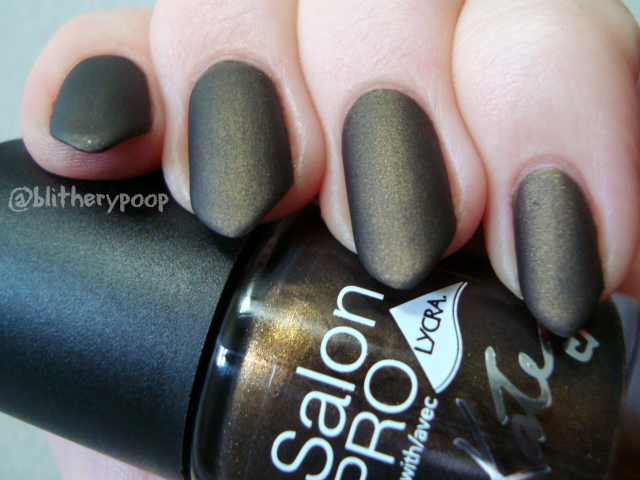 Have you tried these or any of the other Salon Pro polishes? What do you think of the brush? I picked up these two yesterday based on your post! And I had ExtraBucks so I paid...ZERO DOLLARS AND ZERO CENTS. I'm sorry for yelling. I love these murky greenish-brownish-metallicky colors.